It’s difficult for me to find a shampoo I like and will keep using. After trying out tonnes of products, I’m pretty sure the ones that contain sulphates (foaming agents, usually sodium lauryl sulphate) are no good for my hair or scalp — they cause too much irritation. Sulphates get rid of grease, but they can also get rid of natural oils, leaving your hair dry and your scalp itchy (sounds familiar…). They’re used in household cleaning products and although they’re safe, they’re not the most gentle of ingredients. Several brands have released sulphate-free shampoos. Found in many conditioners and glossing products such as serums, silicones create a shiny look and feel, and give hair that post-shower slip. However, over time some silicones create build-up, which weighs the hair down and makes it look dull. Dull hair is the last thing I want, so I started wondering if there were any good silicone-free hair products I could try. With all this in mind, I headed off to investigate The Body Shop’s Rainforest haircare and ended up buying the Shine shampoo and conditioner, which cost £4.50 each. Both products contain pracaxi oil, cameline seed oil and Community Fair Trade olive oil. I love this shampoo. It cleanses hair thoroughly but it’s not harsh in the slightest, nor is it too heavy for my fine hair. I’ve had less of a greasy patch on the crown of my head since I started using it, too. It’s best to add water if you want to create a lather (sulphate-free products are less sudsy), which makes it easy to work through the hair. The scent is very fresh and reminds me of plants. Quite a vague comparison, I know, but that’s really the best way I can word it. Whatever it is, I really like it. You can barely tell this is different to standard conditioners, although The Body Shop do recommend you add a little water before you run it through your hair. The difference becomes more obvious once your hair is dry because it has more grip to it, although mine still felt very moisturised and it was easy to detangle. I like to use a tiny bit of the Lush R&B Hair Moisturiser on the ends and then just leave my hair to do its thing. 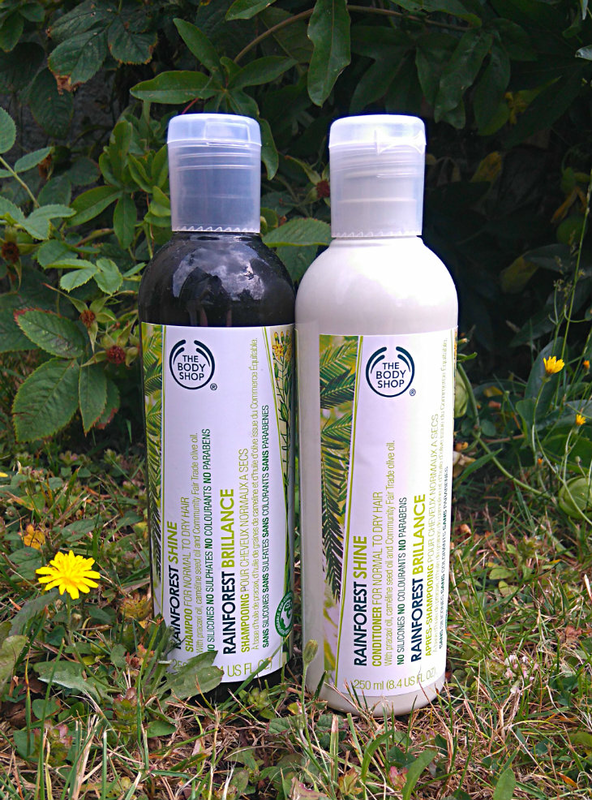 Overall I’m very happy with the Rainforest Shine range – it’s rare for The Body Shop to let me down. Both products promise shiny hair and although the end result isn’t mirror-like, you’ll still be left with clean, soft hair that looks healthy and isn’t weighed down. I’m not going to go as far to say I’ve found the perfect hair products for me, because the search never seems to end, but at the moment I’m happy to keep using this duo. I may even repurchase. What are your favourite haircare products? Let me know in the comments.